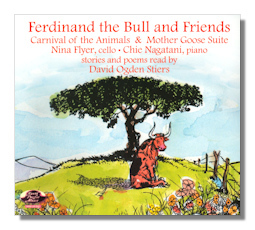 Mark Fish: Music for Ferdinand the Bull. These stories and poems for children are wonderfully read by David Ogden Stiers. He has a fine voice, with excellent and warmly expressive inflection, and he is utterly without condescension or corniness. The second outstanding thing on this recording is the music by Mark Fish for Ferdinand the Bull, and some adults as well as children may find this disc worth hearing just for that. It is lively and rhythmically inventive. My only reservation about the music here is that, in spite of the valiant efforts of Nina Flyer, a solo cello, augmented by piano, cannot substitute for a whole orchestra in Carnival of the Animals. But there are many other versions of this piece. The duo will not sound inadequate in The Mother Goose Suite, I think, although, as music, the orchestration is also more satisfying. If I may add a personal note, The Story of Ferdinand, on a much earlier recording, was something I enjoyed as a young child. Hearing it now, decades later, I take satisfaction in its spoof of the macho spirit, set right in the Middle of Madrid as it happens here. The thought of all those other fierce bulls, eager to fight, even to their unforeseen deaths in the bull ring, in contrast to Ferdinand's contentment with the delights of nature surprises me with the realization that, if early exposure to this story did not actually help mold my character and personality, it surely reassured me about what I was like. There is a pocket in the CD case containing fifteen round flash cards, about the size of drinks coasters, on thick, sturdy, glossy paper, with colored cartoon-like pictures of animals on one side and Ogden Nash's poems on the other side. Recommended for children – and for some simply young at heart.